To Sum It Up: Juliette Ferrars can kill with her touch, and it’s the reason why she’s been abandoned by her parents and locked up in an asylum. Clinging to her sanity, Juliette is suddenly taken from her four wall prison and brought before Warner, one of the sector heads for the ruling body known as The Reestablishment. Warner possesses an extremely keen interest in what Juliette can do, and she is horrified to learn that he wants to use her as a weapon. Juliette, however, would rather face the consequences for not cooperating, even death, than become the monster she’s always been labeled as. 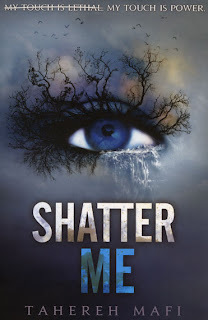 Review: Shatter Me is one of those books that I’d seen mentioned everywhere and kept telling myself I was going to read, but other books always ended up jumping ahead of it on my to-read list. It wasn’t until my cousin read this and began nagging me to do the same that I cracked open my copy at last, albeit with some skepticism. I’d heard that the writing style was a little out of the ordinary, with strikeouts throughout the text. Lately I’ve also been laying off the dystopians somewhat, reading the occasional one when the mood strikes. So between the question marks surrounding the writing and whether this was going to be a dystopian that would click with me, Shatter Me had quite a bit to prove, but prove itself it did. Many, many times over. My chief worry over the text strikeouts was that they were going to come off gimmicky, but I didn’t see them that way at all. They were used to excellent effect, and not so often that they were distracting. I loved the prose; I loved its flow and its imagery and how it sometimes seemed like poetry. It’s one of the reasons why I couldn’t put the book down; I was addicted to the writing and couldn’t read the book fast enough. Although you get sufficient details of the world to assemble a picture that’s bleak—iron-fisted rule by a regime that rose to power on promises to make life better for its citizens but has failed to deliver on them—I found the dystopian element on the lighter side. Not that I’m complaining. How can I explain it? For me, the focus of the book was Juliette, her struggle not to lose her mind locked up in an asylum, and then her struggle not to let some crazy guy use her power for who knows what purpose except that it’s probably not good. For me, the world was secondary to all of this, and I had enough knowledge of it to get the idea of what it was like but not be overly concerned about the minutiae of it because my attention was elsewhere. Readers who prefer their dystopian aspects with a stronger emphasis may need a tad more from the world-building, though. Poor Juliette has been in the asylum for close to a year because everyone, including her own parents, fears her deadly touch. Her despair, not only over her loneliness but also how she perceives herself as a freak, is gut-wrenching. All of her raw emotions—fear, desperation, and later determination not to be manipulated into becoming a weapon for The Reestablishment—are conveyed so vividly by the prose. Two things really struck me about Juliette’s character: how hard she fought to keep herself together in an environment that would have driven anyone over the edge, and her defiance in refusing to hurt others with her power, no matter how cruelly she’d been treated in her life. Remember the crazy guy I alluded to earlier, the one who had plans for Juliette and her ability? That would be Warner, AKA the majority of the reason for this book’s rating. When a character takes hold of my brain the way Warner did/does, I cannot ignore how much what I felt for a particular character influenced my overall enjoyment of a book. I don’t think Warner and I even had a love-to-hate type thing going on. I loved that he was deranged. I loved how he took over the novel (at least for me) the very second he appeared. I loved that he was calculating and ruthless and didn’t care that everyone knew it. Did I mention that I loved how deranged Warner was? Look, I know that I’m pretty deranged for loving a character with personality traits as winning as Warner’s are. Common sense says that Adam, one of Warner’s soldiers and a face from Juliette’s past, would make a much better fictional boyfriend, but I’ve always been far more intrigued by the bad boys. I’m sticking with Warner. Shatter Me had me absorbed from start to finish. Any doubts I had about it dissipated quickly. The beautiful prose, the tension, the action, and a certain character all combined to turn me into an instant fan of this series. All in All: I absolutely loved this. So thanks, Melissa, for all of that nagging! Warner is somethin' special. I know what you mean- he's creepy and Adam is obviously better in RL, but bad boys are fascinating. Also, agree; writing is really cool! Glad you liked Shatter Me. Oh yes! I agree with all your points, the prose is so beautiful, and the strike-outs made me feel even more in touch with Juliette. It was as if she was always sensoring herself, afraid someone would realize what she was thinking. The prose was so powerful, especially in making Juliette's feelings so palpable. I really liked how the strikeouts were used, telling you everything Juliette was thinking but might have feared to say out loud. I am so glad that you like this series. The series is fantastic!! I'm glad I'm not the only one who doesn't really understand the actual world that Juliette lives in. It's obviously bad, but the focus of the books is, like you said, on Juliette's story. Normally I'd be annoyed by not knowing everything about a dystopian world, but with this one, I feel I know enough for it not to bother me, plus I'm too focused on the rest of the story to really notice. Oh, I definitely did love him more after reading Destroy Me! :D And I'm so happy to see some Warner love in the comments! Great review :D. I feel the same way about Warner. I know he is bad and not in his right mind for most of this book, but there is something about him that captivates you. And I love how we get to see more of him and all of his different personalities and his derangedness in the second one. So glad you loved this one :D.
For me, Warner just stole the book from everybody else. I couldn't wait to find out what he was going to say or do next because he was so unpredictable. And after getting all caught up with the series, I still don't know what to think of him most of the time! Lovely review Lee! Like you, I've been holding off on this one mainly because of the strikeouts. I was all for buying a copy last year until I leafed through it and saw those. Every single person who's read it though says it is used to brilliant effect and that you get used to it after awhile. I finally caved and bought a copy of book 1 and after reading your review, I'm desperate to sink my teeth into this one :D Glad you loved it! I hope you love it too, Micheline! I was leery going into this, but I was completely and pleasantly surprised by it. The prose is lovely, and I've got a severe case of Warner-itis, lol.